My last post focused on the definition of administrative value. However, the records we create as government employees have other sorts of value as well. As I mentioned before, we analysts set retention periods for these records based on these different values. Let’s now look at each of the remaining values and their associated records. 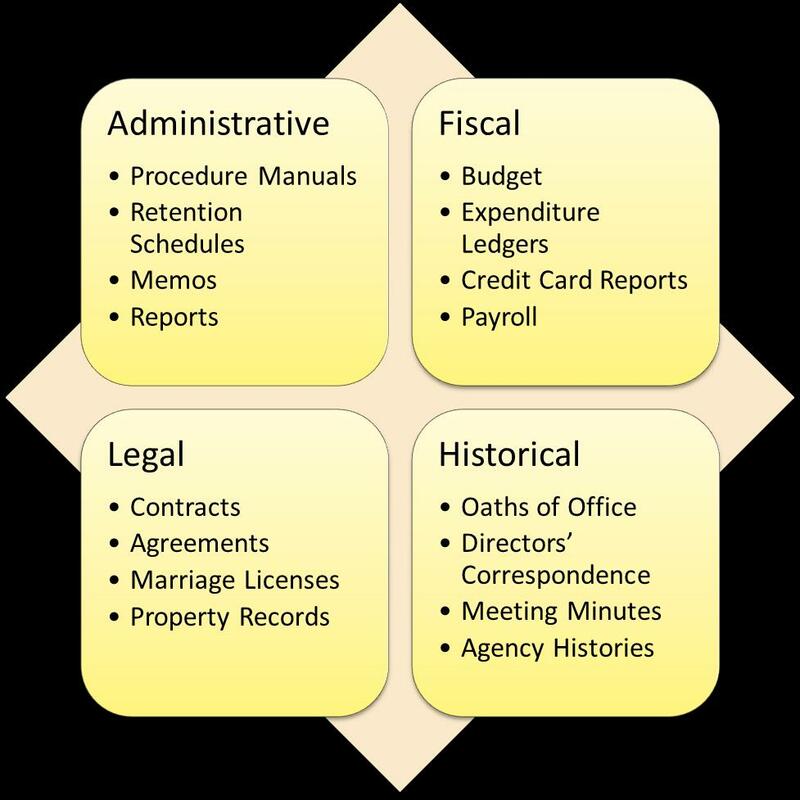 Records with fiscal value are those that fulfill and document financial authorizations, obligations, and transactions. They are often subject to audit and therefore must be kept for the time period that an audit can be initiated. We have inserted language into the schedule to remind you not to destroy certain records subject to an audit, but we cannot catch them all, so you should be aware of what records you are responsible for that may be subject to audits and keep them accordingly. If you know that your office, for example, has to assist the Office of the State Auditor in examining grant audits, or something along those lines, let us know. And if you believe that it is possible that an audit may take place in the future, do not destroy any records, even if your records schedule says that you may. Once audits have been resolved, fiscal records often lose their value rapidly. Much like fiscal records, records with legal value can often be subject to official actions such as subpoenas, investigations or lawsuits. Records with legal value contain evidence of a legally enforceable right or obligation of government. They must be made available if they are requested for litigation, meaning they cannot be destroyed once requested even if the records have met their scheduled retention period (think Enron). In the Records Retention and Disposition Schedule, we use the same language that is used for records that can be audited to ensure legal records are preserved. Job applications comprise a common example of records that would fall into this category. Applications for people not hired are scheduled to be destroyed in office after 3 years, unless there is a discrimination charge pending against those records. If a charge has been filed, the records must be kept at least until the charge is finally resolved. If you have concerns about some of your records, be sure to bring that up with a records analyst. Some records have enduring value, even beyond what you might be able to see. The deeds of land and minutes to county boards all have research value because they can show us the history of a piece of land or the history of a county. Some records document significant historical events such as the bill of rights that was recently returned to the State of North Carolina and is now in the custody of the Department of Cultural Resources. They may also document either directly or indirectly family histories. Some records evidence significant actions of government such as key correspondence or policy directives from your administration. You can also think of records with historical value as those you would want to have on hand to write a history of your office or for an exhibit celebrating your department’s 100th anniversary. Part of our responsibility is to try to ensure that these and other parts of the historical record of this state are preserved. In the Records Retention and Disposition Schedule we have indicated those records that are permanent. For records that your agency wishes to retain in office indefinitely because they are needed for reference on an ongoing basis, we are available to help you preserve and ensure the longevity of those records. Government Records provides security microfilming of meeting minutes for any governing board, which will be the topic of a future blog entry.